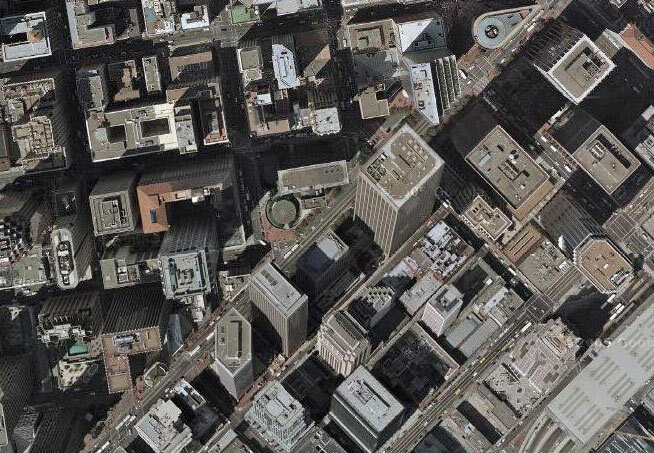 I know San Francisco is well known for being a bit wonky, but isn't there something seriously wrong with this view of San Francisco's financial district, from Google Maps? It looks like something M.C. Escher would create. Also see, the ghost cars of the Ventura Freeway. which just took off from Taiwan International. By the way, Derek, the highest zoom images of San Francisco are not taken by satellites, as evidenced by the progressive perspective change across areas that are obviously from the same shot (the perspective change between areas that are not from the same shot means nothing, of course). The high-level zoom shots are probably taken from low-flying airplanes. I’m extremely impressed, though, with how the shots are stiched together. If it weren’t for the wildly different perspective and shadows, I’d never be able to tell that different images were used. I don’t see any seams. I must reiterate how impressed I am with the photo stiching. It seems to be 3D aware. Perhaps it’s http://www.aerialimagingtechnologies.com/ , which has coincidentally been in the news recently.